مرزبند, رحمت اله, ملایی, محمد, نصیری, ابراهیم. (1397). بررسی رابطه نماز جماعت با سلامت معنوی دانشجویان علوم پزشکی مازندران. طب و تزکیه, 27(ویژنامه علوم انسانی سلامت), 62-73. رحمت اله مرزبند; محمد ملایی; ابراهیم نصیری. "بررسی رابطه نماز جماعت با سلامت معنوی دانشجویان علوم پزشکی مازندران". طب و تزکیه, 27, ویژنامه علوم انسانی سلامت, 1397, 62-73. مرزبند, رحمت اله, ملایی, محمد, نصیری, ابراهیم. (1397). 'بررسی رابطه نماز جماعت با سلامت معنوی دانشجویان علوم پزشکی مازندران', طب و تزکیه, 27(ویژنامه علوم انسانی سلامت), pp. 62-73. مرزبند, رحمت اله, ملایی, محمد, نصیری, ابراهیم. بررسی رابطه نماز جماعت با سلامت معنوی دانشجویان علوم پزشکی مازندران. طب و تزکیه, 1397; 27(ویژنامه علوم انسانی سلامت): 62-73. 3استادیار، گروه بیهوشی و اتاق عمل، مرکز تحقیقات طب سنتی و مکمل، دانشکده پیراپزشکی، دانشگاه علوم پزشکی مازندران، ساری، ایران. معنویت یکی از ابعادسلامت محسوب می شود..هدف این پژوهش بررسی رابطه اقامه نماز جماعت با سلامت معنوی دانشجویان علوم پزشکی مازندران در سال تحصیلی 96-97 بود. در این مطالعه از روش تحقیق کوهورت استفاده شد. جامعه آماری پژوهش، دانشجویان دانشگاه علوم پزشکی مازندران تشکیل داده که از بین آنها به تعداد 160 نفر به عنوان نمونه پژوهشی با روش نمونه گیری بر مبنای هدف و با استفاده از نمونه گیری آسان انتخاب شدند. برای گرد آوری اطلاعات ، پرسشنامه سلامت معنوی فرهنگستان علوم پزشکی روی نمونه پژوهش اجرا شد. برای تحلیل یافته ها از آزمون هایT-test و Chi2 استفاده شد و ارزش p کمتر از 0.05 درصد معنی دار تلقی شد. باتوجه به ارتباط اقامه نماز جماعت با سلامت معنوی دانشجویان ، می توان با برنامه ریزی بهتر در فرهنگ سازی بیشتر اقامه نماز جماعت در دانشگاه ها ، موجبات ارتقای سلامت معنوی دانشجویان را مهیا ساخت. Background and Objective: spiritual health are considered as one of the dimensions of health. The purpose of this study was to investigate the relationship between congregational prayer and spiritual health of medical students of Mazandaran University of Medical Sciences. Methods and Materials: In this study, a cohort study (cohort) were used. The population of the study consisted of male and female students of Mazandaran University of Medical Sciences. Among them, 160 individuals were selected as a research sample by objective sampling method and using easy sampling. To collect information, the Spiritual Health Questionnaire of the Academy of Medical Sciences was applied.T-test and chi2 tests were used to analyze the findings and p value less than 0.05% was considered significant. The results of the study showed that the average total score of students' spiritual health divided by groups of prayer and control groups was 19.75 ± 9.5 and 70.6 ± 14.6 respectively. There was a significant difference in the level of spiritual well-being between two groups of observer prayer and control students (p <0.001). . Also, the average of the scores for the insights, behaviors and spiritual tendencies showed that Congregational prayer students had more spiritual insights, spiritual tendencies and spiritual behavior than the control group. 1- Azizi F, Spiritual health, (2014), Hoghogi Publication. Tehran. 2-Abbasi, M., Azizi, F., Shamsi Gooshki, E., Naseri Rad, M., & Akbari Lakeh, M. Conceptual definition and operationalization of spiritual health: A methodological study. Medical Ethics journal, (2012): 6(20), 44–11. 3- Mesbah, M. (2013). Islamic approach to spiritual health. First edition Hoghooghi Pub., Tehran. 4-Thomas Obisesan, Ivor Livingston, Harld Dean Trulear, and Frank Gillum. “Frequency of attendance at religious services, cardiovascular disease, metabolic risk factors and dietary intake in Americans: An age stratified exploratory analysis.” International Journal of Psychiatry in Medicine 36 (2006): 435–48. 5-Frank Gillum, and Carla Williams. “Associations between breast cancer risk factors and religiousness in American women in a national health survey.” Journal of Religion and Health 48(2009): 178–88. 6-Lin HR, Bauer‐Wu SM. Psycho ‐spiritual well‐being in patients with advanced cancer: an integrative review of the literature. Journal of advanced nursing. 2003; 44(1):69-80. 7- Miller WR, Bogenschutz MP. Spirituality and addiction. South Med J2007;100(4):433-36. 9- Sagharvany, S. GhayourBaghbani, M. (2009). Spirituality, self-flourishing and spiritual intelligence at work. HonarehModiriat. 8: 27-31. 10-Mozafarinia, F. Amin-Shokravi, F. Hydarnia, AR. (2014). Relationship between spiritual health and happiness among students. Journal of Health Education and Health Promotion. 2(2): 97-107. 11- Moghimian, M. Salmani, F. Azarbarzin, M. (2011). The Relationshi between Test Anxiety and Spiritual Health in Nursing Students. Qom Univ Med Sci J. 5(S1): 31-36. 12- Holy Quran, Trans by: Naser Makarem Shirazi, Tehran, Dar Al-Quran Publication, 2017. 13- Majlesi, Muhammad Baqir. Bahar al-anvar. Beirut: Moassese Al-Vafa, 1984.V 82, p. 345. 14- Noori, Mirza Husain. Mustadrak al-Wasa’el. Qum: Moassese-Aloalbit–Laehya-Al-ltoras, 1987. Vol 1, p.488. 17- Chavoshi, A., Talebian, D., Tarkhorani, H., Sedqi-Jalal, H. B., Azarmi, H. M., Fathi-Ashtiani, A. The relationship between prayers and religious orientation with mental health , Journal of Behavioral Sciences , Vol 2, No. 2, 2008. 18- Shojee a, Relationship Between Attitude and Practical Commitment to Prayer with Acceptance of Responsibility Among Graduate Students of Semnan Universities Culture in The Islamic University, 2018 (Spring) 26 , Vol. 8, No.1. 19- Shahriary R, Aminbeidokhti A ,Moradi F , The Study of Relationship between Attitude and Practical Commitment to Prayer with Happiness of the Students (Case Study: Students of University of Mohaghegh Ardabili), Culture in The Islamic University, 2013 (Spring) 26 , Vol. 3, No.6. 22- NooshafarenSafari , Ali abasMiraghaei , Sheren Ghazi * , KobraMoradi. 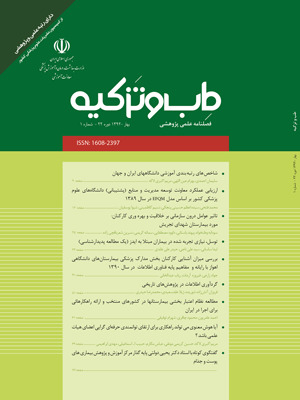 The relationship between adherence to prayers and mental health of students in KhoramabadPayame Noor university, Lorestan University of Medical Science, 2014: Vol 16, Issue 2, P. 71-79. 23- Parisa Amiri, Mahmoud Abbasi, SafuraGharibzadeh, Mohammad AsghariGharibabadi, NajmehHamzaviZarghani, FereydoonAzizi, Designation and psychometric assessment of a comprehensive spiritual health questionnaire for Iranian populations, Medical Ethics Journal. 2015, Vol 9, No 30 . 24- The Big Religion Chart. (2014). Retrieved from www.religionfacts.com: http://www.religionfacts.com/big_ religion_chart.htm. 25- E. James Baesler, Terry Lindvall, & Sharon Lauricella; Assessing Predictions of RelationalPrayer Theory: Media and Interpersonal Inputs, Public and Private Prayer Processes, and Spiritual Health, Southern Communication Journal, 2011: Vol. 76, No. 3, , pp. 191–209. 26- Ahmadifaraz M, Reisi-Dehkordi N, Mosavizadeh R, Ghaderi S. The Effect of Group Spiritual Intervention Based on the Quran and Prayer on Spiritual Health of Patients withCancer. J Isfahan Med Sch 2015; 32(320): 2454-63..
27- kobraNasiri; mahdiZareBahramAbadi; soleyman Ahmad Bookani; somayehValizadeh, The Role of Religious Seclusion in Psychological Well-Being of Student , Culture in The Islamic University, 2016 (Summer) 19 , Vol. 6 , No.2, Page 171-318. 28- Tabatabaei, Mohammad Hossein. Al-Mizan Commentary. Qum: Daftare Entesharate Islami Jamaee Modaresin HowzehElmie Qum, 1984. 29- Mesbah, Mohammad taghi. Ethics in Quran. Qum: Imam Khomeini Educational Research Institute, 1999.